Do you have the energy for a remodel? This is the first installment of a series of articles on remodeling an existing house in Puerto Armuelles. In a recent article that I wrote on building materials in Panama, I briefly describe the challenges posed by building with wood. 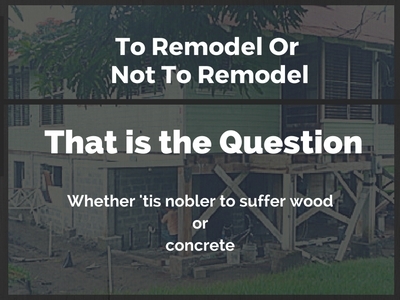 Now I will explore the pros and cons of remodeling a wood house in more detail. At the end of this article, I also briefly discuss remodeling a cement house. I have spent my entire career building with wood: in Seattle, Alaska, even in Japan. So it seems strange for me to take such a strong stance against building with wood. Especially in Puerto Armuelles, which initially was built entirely with wood. The United Fruit Company, later Chiquita Banana, built Puerto Armuelles from the ground up using red cedar 2×4’s they shipped down from Portland Oregon. I suppose if I were 36, or 46, rather than 56, I might feel differently. Or if I hadn’t already spent half of my life remodeling houses. Or if the weather were cool, as it is in Seattle, or Alaska. I have met guys from various parts of the south, including Houston Texas who have told me that “Where I’m from it is 20 degrees hotter today”. These guys work in blue jeans in Panama. I have spent the better part of my adult life in the Pacific Northwest. On the hottest days in Panama, I sweat just standing still. I guess what I am trying to convey is that it depends a great deal on the personality, and talents of the potential remodeler. If you are one of those men, or women, who has a tough time sitting still, or if you have looked forward to retirement so that you would have time for projects like remodeling an old Chiquita Banana house in Panama, then remodeling and old wooden house here might be just your cup of tea. Low Cost – (maybe) Depending upon the sale price of the house. Ten years ago wooden Chiquita homes in Las Palmas were going for $10,$20, $30,000. However, the current asking prices for the nicest homes in Las Palmas is in the $120k-$350k range. You can still pick up a deal, but the house is unlikely to be in good shape. I would advise, as with any purchase in Puerto Armuelles, that you take your time, ask around. Eventually, you will find what you are looking for at a price that fits your budget. In some of the less elite neighborhoods (that paradoxically are closer to the beach) deals are easier to come by. I think that, with patience, you still might be able to buy a wooden house in Carmen for under $14K, possibly even $11k. Carmen is a densely populated, working class neighborhood (noisy on the weekends). But Carmen is very well located on the ocean breakwater, at the south end of the downtown. The quality of the houses is already slowly improving in El Carmen, due to an inflow of new money into town. Many locals, even a couple of expats, are repairing and remodeling in Carmen. Prices can go nowhere but up. Quality 2x framing lumber is hard to come by in Puerto Armuelles. We are very much of a masonry, cinderblock construction culture here. Pressure treated 2x studs are available in David, imported from Canada and Chile, I believe. But they are expensive. At my last investigation, 2×6 pressure treated hem-fir cost over $2.00 per lineal foot. Prices may have come down, due to increasing demand; In the near future this may not be an unusual product anymore. 2. Labor cost. Another serious consideration when deciding whether or not to remodel a wooden house is labor cost. On a per day basis, construction labor here in Puerto Armuelles is a steal. Workers get $20, $25, and $30 per day here. However, they don’t have much experience working with wood. This means the efficiency level of these laborers is nowhere near a professional building crew in the States or in Canada. A small 2 or 3 bedroom house that 2 skillful carpenters might frame in the States or Canada in a few weeks, could well take a crew of 6 men here several months to complete. And complete with a far lower quality of fit and finish. It is just not a woodworking culture. I know from conversations with Milton Hutto, owner of Heavenly’s Hotel in San Vicente that he felt that he should have torn down the existing concrete house that became part of the West Wing of his hotel. Most of his project was built using M-2, steel rebar, and concrete stucco. Obviously, Milton knows what he is talking about. He was there on-site during most of the construction, and he had prior building experience in Puerto Armuelles. Watch a video of Milton talking about building a house in Panama, as an expat. Just click the link. However, one should consider the scale of the project, before dismissing remodeling a concrete block house out of hand. In Milton’s case, he was building an 11 room hotel, not a small, single family, or single person dwelling. He employed a crew of at least 10 men. With this work force, costs were high, and quick progress was an absolute necessity. 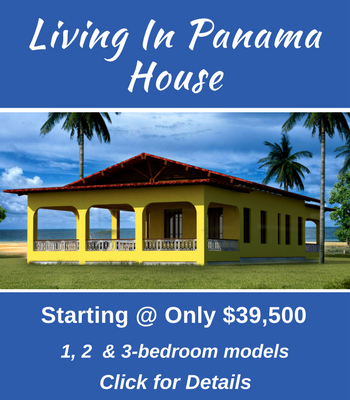 Find out about building your house of concrete in Panama.